Pressure point fighting, vital points, dim-mak, hyel-dul, and kyusho-jitsu are all words used to describe the methods of attacking vulnerable locations on the human body. If you have been involved in the martial arts over the past several years, you will have noticed that a new trend is creeping into the world of combat science. Many seminar instructors around the world are preaching the gospel of pressure points, and how they apply to the martial arts. 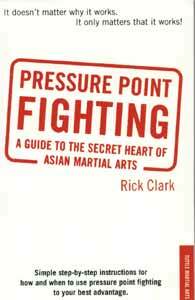 Rick Clark is a leader in this movement to educate martial artists about pressure points and their use in the United States and abroad. Rick Clark has been practicing the martial arts of Judo, Karate, Taekwon-do, and Arnis since the early 1960's. He brings these many years of experience as well as a love for research into his new book "Pressure Point Fighting: A Secret Guide to the Heart of Asian Martial Arts." In the preface of the book Clark writes, "you will not find anything in this book that has not been written elsewhere before." Why then would I recommend that you purchase this book? The answer lies in the presentation of the material. Rick Clark has taken the complex and confusing world of vital points and stripped it down to a basic idea; "It does not matter why it works, it only matters that it works." This pragmatic approach stands in marked contrast to many of pressure point teachers who either ground their teachings on the science behind their work. On one hand, there are people who claim we should follow the ideas and teachings of Modern Western Medicine, neurology and science. They state that we live in a society that uses this paradigm to explain our medical care so we should stick to the science that we have developed to explain the functions of our bodies. On the other hand, there are the people who claim that we should use Traditional Chinese Medicine's concepts of qi (or energy flow) which embodies a holistic approach to understanding the science of pressure points. They make the argument that the original founders of the martial arts system lived and worked under this paradigm and therefore we should resort to the science that they developed to explain the functions of the body. Both schools of thoughts contain strong arguments. Mr. Clark also explains the basic ideas and principles from each orientation. He then goes on to state his opinion which is "hit them at their weakest point" (Sun Tzu). The opening chapter is devoted to explaining Mr. Clark's "Core Principles." These are ideas and concepts that you can apply to your study of the martial arts. For example, Targets of Opportunity, Out-of-the-Box Thinking, the K.I.S.S. (Keep It Simple Stupid) concept and many others. With a basic understanding of Clark's world view, you can then apply these principles to the study of your own individual art. One does not have to change styles of martial arts in order to use vital points to gain an advantage. You are encouraged to find the vital point information hidden within the style that you are presently studying. The next section of the book deals with various applications to movements found in the kata of Chinese, Korean and Japanese fighting arts. Professor Clark uses the katas as a blueprint for his vital point techniques. He states that kata contains vital point attacks and will show you the correct angle and direction to activate these points on the body. The movements and techniques are presented with charts of the various vital points being used and where they are found on the human body so it is easy to follow along even if you do not practice the form that he is working with. Mr. Clark's book concludes with detailed printed lists of the various vital points and their locations. Also presented are various lists of vital points from several pre-WWII and post- WWII authors. Clark states that the knowledge of vital point usage in karate and other martial arts was hidden from the public view after World War II. The charts in the back of this book serve as proof for that theory. Some of the these charts are from books that are quite rare and many have been out of print for several decades. So, if you desire to expand your martial arts knowledge, or have felt that there was something missing in your studies, I would recommend Clark's book. What he portrays is not art or style specific, but is something that can be used to expand the effectiveness of virtually any martial art. Jeremy Bays is an experienced martial artist and writer who hold a black belt in Chun Do Kwan Taekwon-do, Chinese Kempo jiu-jitsu, and is currently working in Kali and Jeet Kune Do. He lives in Farmland, Indiana with his wife and two daughters.